If you’re time poor and you want something quick and easy to grab for breakfast, this would certain do the trick. 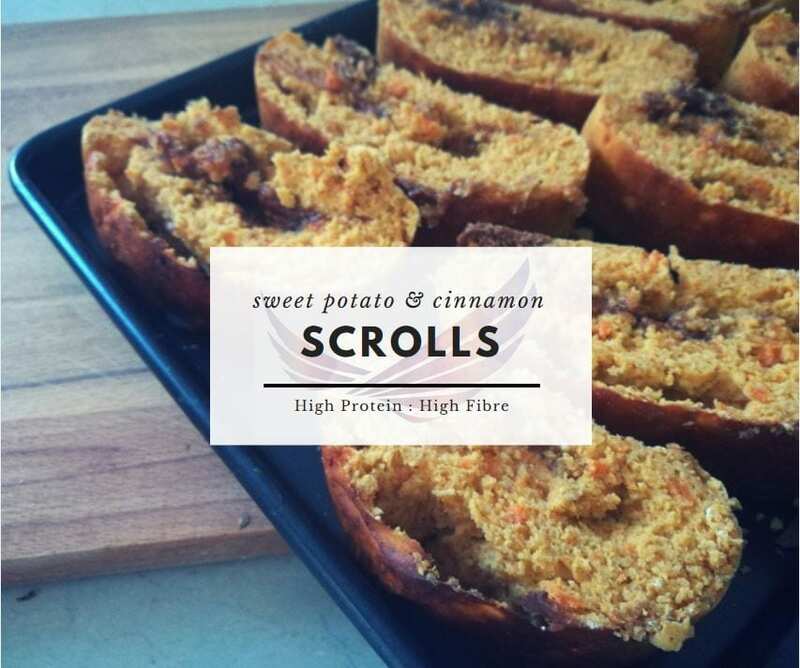 With 1/3 of your daily fibre needs and nearly 30g of protein, these scrolls will definitely keep you full whilst giving you the convenience of something you can grab and go. About lupin flour: Lupin flour is made from lupini beans, which are a form of lentil similar to a peanut. This flour is what helps give this recipe the high amounts of protein and fibre and is a great option to use in baking if you wish to exchange higher carb, refined flours with something more nutritionally dense. You can buy lupin flour either online or from a local health food store. If they do not have it in stock, they can order it in for you. Please note though, that because the lupini bean is similar to peanuts it may affect those of you who have sensitive tummies and is not suitable for people with peanut allergies. Peel and chop one large sweet potato and boil until tender. Meanwhile, warm the coconut milk in a small bowl in the microwave for 20 seconds and then add the yeast satchet. Mix gently, cover with cling film and then place in a warm area of your kitchen for 20 minutes to prove. Mash the sweet potato in a large bowl until smooth, and then add the egg and yeast mixture and whisk well. Place all dry ingredients (oat flour, lupin flour and WPI/WPC) in a separate bowl and mix to combine. Add the dry ingredients in batches to the sweet potato, egg and yeast mixture until all ingredients are well combined. In another small bowl, add the coconut oil, stevia and cinnamon with two tablespoons of warm water and mix well. Pour half the sweet potato mixture into a silicone loaf pan or a loaf pan which has been lined with baking paper. Pour over the cinnamon mixture and smooth towards the edges before adding the second layer of sweet potato mixture. Bake in your oven for 25-30 minutes or until the loaf is springy to the touch. Leave to cool before slicing into 10 pieces. Recipes are great, but sometimes it’s hard to know which ones are suitable for you, let alone how much you need to eat to reach your goals. Get the hard work done for you with a tailored nutrition plan, written specific to your needs, tastes and lifestyle. All plans are flexible, sustainable and adapatable, with no cutting of food groups and no restrictive dieting. Fill in the form below to get in touch!